A first responder is a person with specialized training who is among the first to arrive and provide assistance at the scene of an emergency, such as an accident or natural disaster. We have several great forces that service Santa Fe who deserve our respect and appreciation throughout the year. 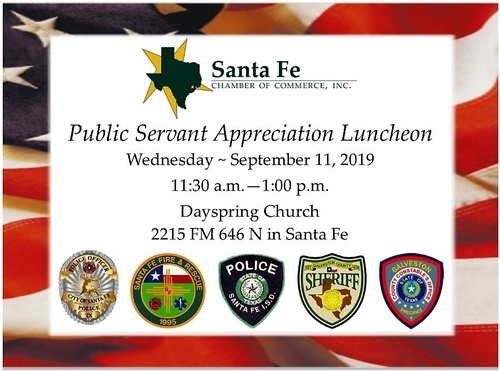 Every year, the second Wednesday in September we host our Public Servant Appreciation Luncheon and take the opportunity to award a first responder from each of the five entities that service Santa Fe. Please mark your calendar to join us and/or sponsor lunch for a Public Servant at this years' event. Chief Meadows elected to award the entire Santa Fe Police Department along with City Marshall, Robert Wood for their efforts as a department in how they responded and reacted to the tragedies that affected our City in 2017 and 2018. Santa Fe Fire & Rescue awarded James Cargile as Firefighter of the Year and Susan Belcastro as EMS of the Year. Chief Braun with Santa Fe I.S.D. Police Department awarded Assistant Chief Gary Forward and Officer John Barnes as Public Servants of the Year. 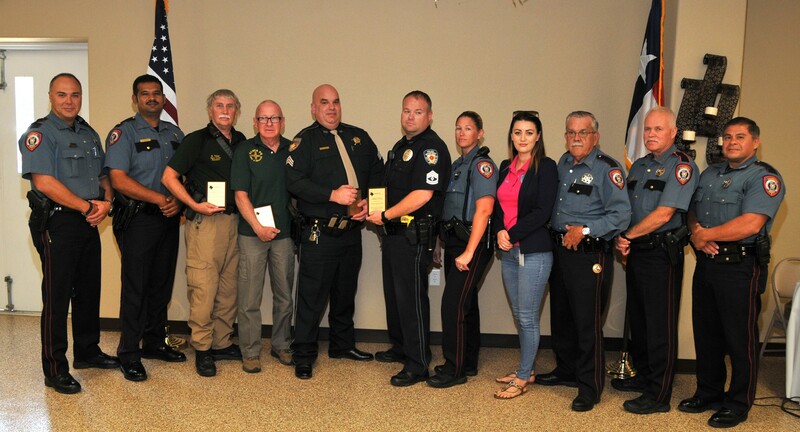 The Galveston County Sheriff's Office awarded Sergeant William Kilburn. The Santa Fe Chamber of Commerce, Inc. Board of Directors awarded Constable Jimmy Fullen for his continued support of the businesses of Santa Fe and our community as a whole. * Spotlight table at the luncheon.